There’s a reason why everyone loves the classics, they’re always reliable and fun, which is exactly what makes Diamond Strike so good to play. This new online bingo game uses the classic theme of fruits and gems which has been used in slot games since the beginning, yet Pragmatic Play have added some fantastic bonus features to keep things fresh and exciting. This game uses 5-reels and 15 pay lines, and you can play on all devices from as little as 15p or as much as £75 per spin. And many more exciting UK bingo promo games! 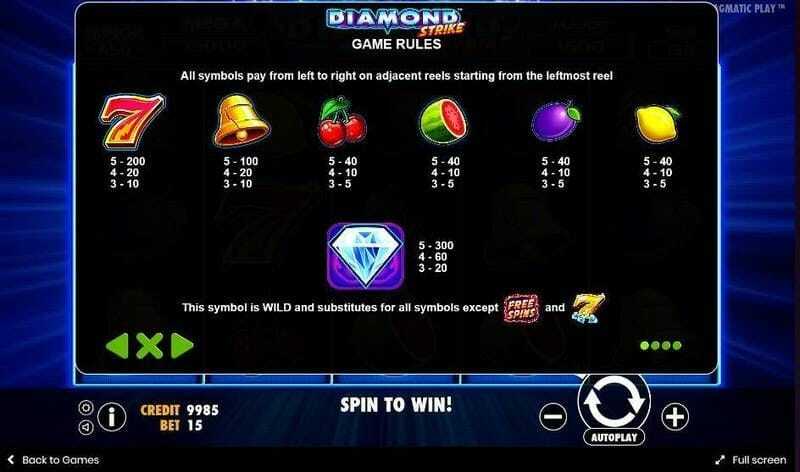 The symbols to watch out for with Diamond Strike are the plums, lemons, cherries and melons, which will award you with 5, 10 or 40 coins when you get a combo of 3, 4 or 5 of them. The bell is worth more as it pays out 10, 20 or 100 coins. The Red 7 is the most valuable of these standard symbols as they pay out up to 200 coins when you land 3, 4 or 5 in combination. The White Diamond is the Wild symbol here, and it substitutes all other symbols on the reels apart from the Scatter and Free Spins symbols. It can also offer you pay outs of up to 300 coins per pay line. · Jackpot Bonus Game – Trigger this round when you land 3+ of the Gold 7 symbol anywhere on the reels in the same spin. A new screen will then open which is made up of 12 diamonds. Keep picking until you get 3 matching jackpot symbols. The Mini will give you 10x your total stake amount. The Minor pays out 30x and the Majoy pays out a massive 100x. 3 Mega Symbols will reward you with 1000x your stake. 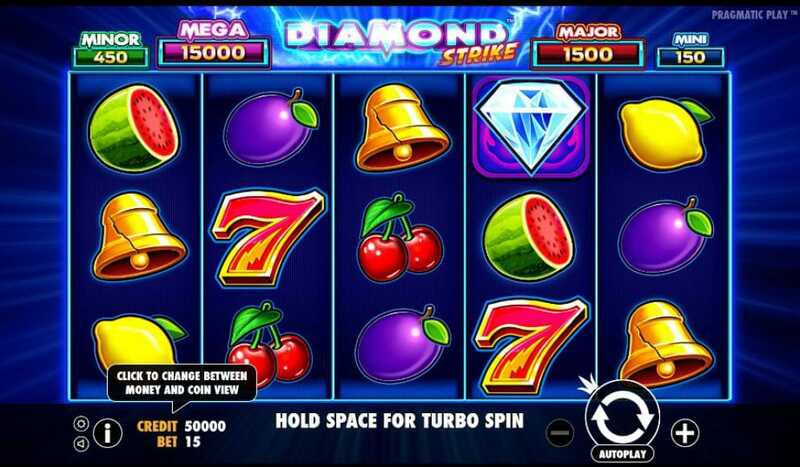 · Free Spins – These are triggered when you get the Free Spins symbol on reels 1 ,3 and 5 on the same spin. This will give you 8 free spins to play with. Keep an eye out for the extra diamond wilds which are added to the reels. There is no limit to the amount of free spins you can trigger. This is a simple and fun game to play with some great bonus features which can help you win some fabulous cash prizes. Don’t miss out, make sure you play Diamond Strike today for a chance to win big! We still have loads of amazing games you can enjoy and learn more. If you enjoyed Diamond Strike why not try Chilli Heat?